The centrepiece of every operating theatre is the operating table. 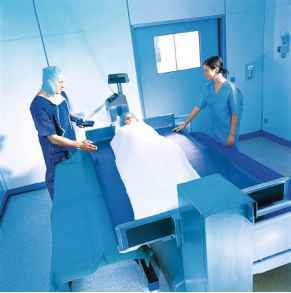 The operating table or the position in which it is erected is the basis for arranging all other high-tech devices, such as ceiling mounts for anaesthesia systems and surgery, operating lights, possibly ceiling-mounted X-ray image intensifiers or surgical microscopes, together with air-conditioning ceilings and panels. In time, various special surgical disciplines have developed from so-called »general surgery«, so that special operating tables have been designed and produced to suit these requirements. The days in which surgeons operated on their patients while they lay in their hospital bed go back more than 160 years. Initially it was sure to be just the low bed height and instable positioning of the patient which surgeons objected to back then (O Fig. 7.2). Remedies were found, resulting in the first »operating furniture«, which already took account of the salient anatomic points of the human body - the hips and the knees. There were far more operating tables throughout the years of development than just those shown here. 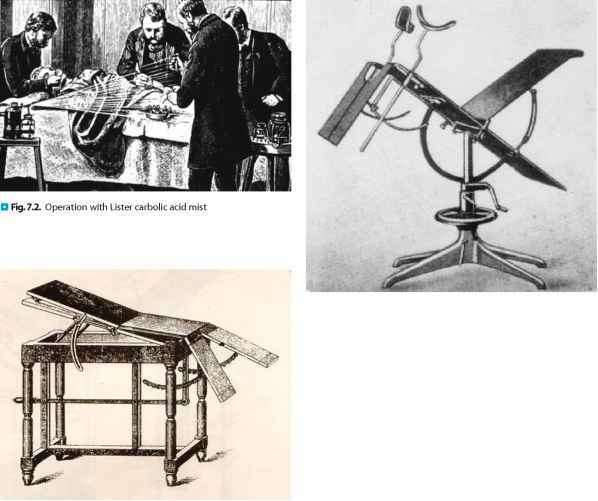 O Figure 7.3 shows an early operating table made of wood, in part with artistically designed details, which only played a visual role, for example turned legs. 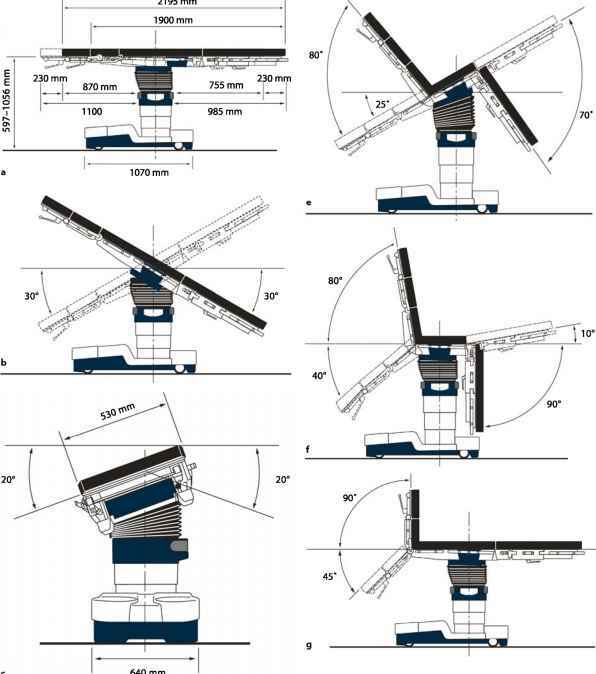 O Figure 7.4 features a mobile operating table on small castors with a metal structure. 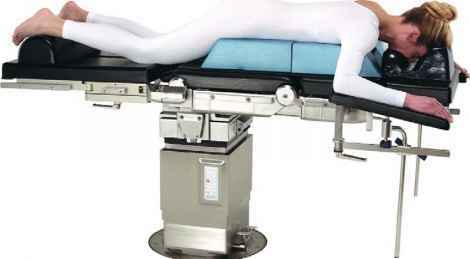 The device for Trendelenburg and reverse Trendelenburg adjustment would become standard in the next generation of operating tables. The operating table according to Hahn with metal structure (narrow operating table foot), which included the device for Trendelenburg and reverse Trendelenburg adjustment, introduced the possibility of adjusting the height (O Fig. 7.5). Further development of operating techniques made procedures more specific and extensive, with far greater requirements for adjusting the operating table and the patient's positioning. The operating table »Heidelberger 3000« with multi-section patient board, hydraulic height adjustment, Trendelenburg and reverse Trendelenburg adjustment already fulfilled many of these requirements (O Fig. 7.6). to allow for the body to be bent in the anatomically correct positions and to position the extremities as required for the operation, e.g. bending, spreading, etc. region remained sterile throughout. As a universal operating table, the »large Heidelberger« fulfilled all the demands made of an operating table for general surgery. It was divided into an upper and lower back plate, seat plate, body bridge, divided leg plates (4-section leg plates as an option) and hydraulic height adjustment so that it was possible to adjust the ideal position for the patient in the operation (O Fig. 7.7). surface has to be radiolucent for X-rays. Up to then, X-ray film cassettes were simply pushed under the patient or the padding surface and exposed from above. Now the demand was to be able to scan through the patient and operating table surface, to see the results of this scan immediately. The world's first operating table system, the new Ma-quet 1120, was presented at the surgeon's congress in Munich (O Fig. 7.8). This operating table system, consisting of stationary operating table columns, removable patient board and transporter, revolutionised functional workflows in the operating suite, at least in Germany and Europe. This was the start of the circulation concept. It was easier to move the patient board with the transporter than the old, heavy mobile operating tables on small castors. The hygienic properties of this operating table system are still valid. In some cases, the »1120« is still fully functional and in use. board is divided into 8 sections and is radiolucent to X-rays. The upper back is moved by motors. The electrohydraulic drive had proven effective for many years and was also successful with the Betastar 1131 (O Fig. 7.10). The patient board is divided into 4/7 sections and is radiolucent to X-rays. 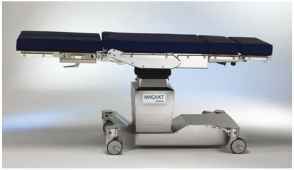 The patient board can be displaced longitudinally by hand and is equipped with a hydraulic back plate as an option. The operating table system Betamaquet 1140 is an electrohydraulic operating table system with stationary and, alternatively, mobile operating table columns together with nine different patient boards with manual adjustment (O Fig. 7.11). 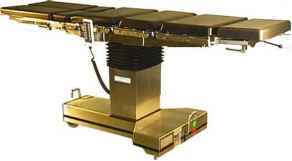 The Alphamaquet 1150 is an electromechanical operating table system with stationary and, alternatively, mobile operating table columns together with 12 different patient boards with microprocessor drives (O Fig. 7.12). table Orthostar 1425 (D Fig. 7.13, not illustrated: Orthostar 1420 from 1985-1997). The Alphastar series has an electrohydraulic drive for all movements (D Figs. 7.14, 7.15). 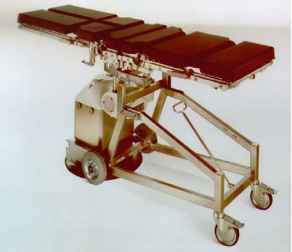 Since 2002, the patient board has a 3-section structure with short reverse back, seat and leg plate. The short reverse back plate can be used for fitting other modules, such as a shoulder plate. A head rest can be fitted on as an additional element, together with extension segments. Patients are placed on the patient board in normal or reverse position. The following versions are currently available: 1132.11, 1132.12 low version and 1132.13 plus. The plus version can take patients with a body weight of up to 450 kg. From 1997, for the first time these versions were offered with an optional electric travel drive. The Classic series was launched in 1998 with the Beta-classic 1118.01, and the Alphaclassic 1118.02 was added in 1999. The Betaclassic is adjusted just manually and with pedals. In 2003, the handling concept for the Alphaclassic was revised, resulting in the 1118.03 (D Fig. 7.16), with elec-trohydraulic adjustments in the column. The patient board is adjusted manually and the back and leg plates are supported by pneumatic springs. 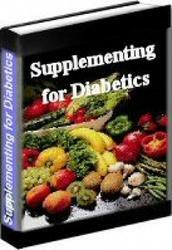 The series is extended by various versions with body bridge or longitudinal displacement. The Alphamaxx combines the advantages of the modular patient board Alphamaquet 1150.30 and the load rating of Alphastar 1132 plus. All movements of the Alpha-maxx are adjusted by electrohydraulic means (7 see Fig. 7.1a-g). The patient board also has longitudinal displacement and divided, separately adjustable leg plates. The Alphamaxx can take patients with a body weight of up to 450 kg (O Fig. 7.17). The mobile special operating table Alphastar top 1132.17 with travel drive is moved electrohydraulically in all directions. The patient board is in 4 sections with headrest, longitudinally adjustable back plate, seat and leg plates. The head is adjusted by an »anatomy arm« which moves the cervical spine in anatomically correct positions without stretching and compression, in every phase of the treatment (O Fig. 7.18). 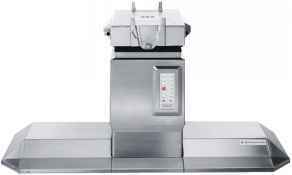 The mobile universal operating table Betastar 1131.12 has an electrohydraulic drive for all movements. It is equipped with a new patient board geometry. The new interface is compatible with modules from the Alphamaxx and Alphastar series (O Fig. 7.19). New operating procedures and requirements for patient positioning will continue to make new demands of operating tables in future. Mobile operating tables and operating table systems will have to be developed further in order to satisfy the expectations and demands of operating teams and patients. Operating tables are always classified as shown in O Table 7.2. Back in the early 1960s, developments in surgery, anaesthesia and new hygiene know-how demanded new concepts for the operating suite. Hospital beds and nursing staff from the wards were not allowed into the aseptic area as germ carriers. The »bed transfer« room was created which was divided into clean and unclean to prevent the entrainment of germs (O Fig. 7.20). Transfer rooms with patient transfer sluices were invented and fitted. Here the patient was handed over to the operating staff in the aseptic part of the operating suite, thus essentially preventing the entrainment of germs. In addition, patient anaesthetising and post-anaesthesia recovery rooms were planned and furnished, together with scrub rooms for the operating staff, each allocated to a specific operating theatre. 4 The patient board surface: it should be radiolucent across the whole surface to allow for unhindered intraoperative X-ray scans. two removable radiolucent patient boards and two mo-torised joints (back and leg plates), together with two transporters for the patient boards. 4 Less weight: the heaviest components of the operating table, the foot and column, no longer have to be moved when the patient is being transported. The foot is omitted completely, and the column is installed in a stationary position in the operating theatre. 4 No small castors: the transporter has large, wide castors which run easily and protect the floor covering. 4 No interfering foot: the stationary, slim-line operating column turns through nearly 360° and offers ideal free foot space. 4 Radiolucent patient board: thanks to the use of radi-olucent materials. In the patient transfer room or sluice, the patient is transferred to the operation patient board with transporter and brought into the preparation room where the anaesthetic is induced. 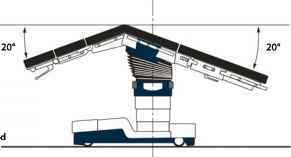 reverse Trendelenburg adjustment), 4 Transporter with adjustable slant and height. Remarks: experience recommends for example that for an expected emergency/ileus intubation, there should always be a transporter with integrated one-hand fast adjustment for Trendelenburg/reverse Trendelenburg adjustment under the patient board! When using modern operating table systems, the procedure for positioning the patient can begin in the preparation room. The patient is then brought into the operating theatre with the easily rolling transporter and positioned over the stationary operating table column. The operating table column is raised to accept the operating patient board with the patient on it. The transporter is removed and the procedure for positioning the patient can be concluded with specific details. 4 the stationary operating table column (O Fig. 7.21 ), 4 the mobile operating table column (O Fig. 7.22) and 4 the rolling operating table column (O Fig. 7.23). Every operating table system has two patient boards and two transporters, so that this kind of circulation concept (O Fig. 7.24) reduces waiting times between operations. Some hospitals work safely, successfully and efficiently with 3 patient boards and 3 transporters per operating table column. The patient boards have been specially developed for effective use in modern operating theatres. They can be brought to the operating table column by the transporter from both head ends. This means for example that the Alphamaquet operating table system has 12 universal and special operation patient boards (O Fig. 7.25). The decontamination system Cleanmaquet reliably cleans and disinfects the patient boards, transporters and accessories which are washable as a standard feature (O Fig. 7.26). 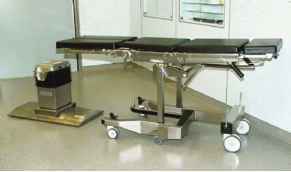 Why table column is centrally placed in a stationary operating table?